A Florida driver escaped from the cab of semi-truck dangling off a busy Gulf Coast bridge after crashing through a concrete guardrail early Friday. According to WFLA, 49-year-old Troy Betts was driving northbound on I-75 near Sarasota when a car moved lanes in front of him. Betts lost control of his semi-truck while trying to avoid hitting the car and crashed through the bridge's railing. 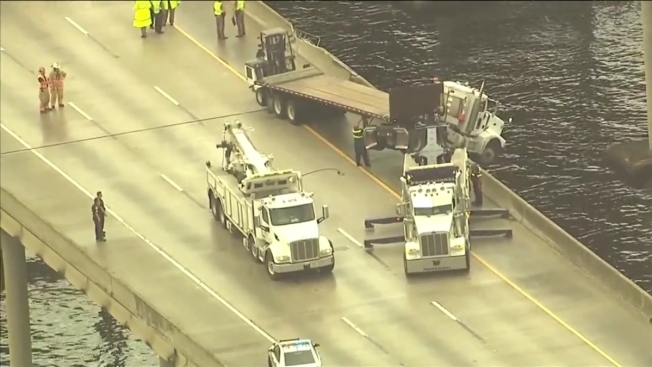 The accident left the cab of the truck dangling over the JD Young Bridge in Manatee County and shut down northbound lanes, backing up traffic for miles on one of Florida's busiest highways. It was not immediately clear how Betts was able to escape from the semi's cab. The truck was pulled back onto the bridge by 8:40 a.m., WFLA reported.